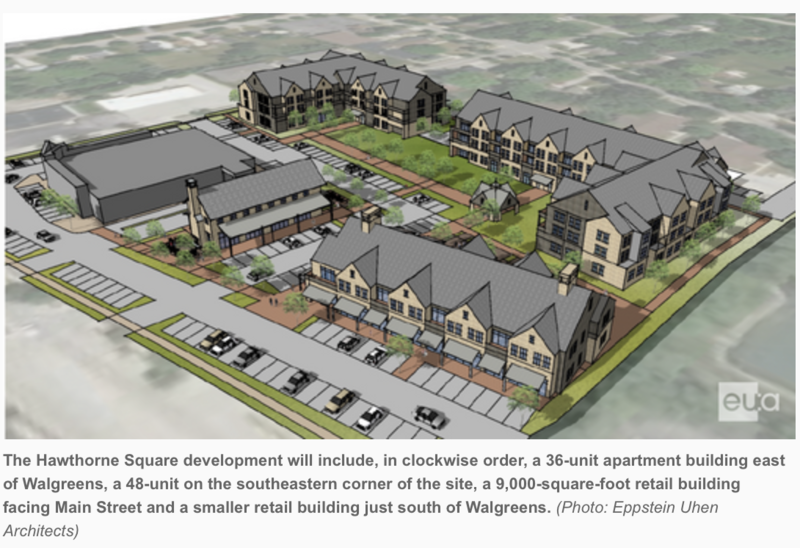 Two retail buildings and two large apartment buildings could be coming to the mostly vacant property surrounding the Walgreens at the southeastern corner of Main Street and Friestadt Road in Thiensville. The project, known as Hawthorne Square, would be developed by sisters Trish Ullrich and Maggie Beach, the owners of NexJenn Real Estate. Their experience is primarily in real estate management; this would be their first development project. The two, three-story apartment buildings include a 36-unit apartment building just east of the Walgreens near Freistadt Road, and just south of there, a 48-unit apartment building on the southeast corner of the lot. The State Farm insurance office just south of the Walgreens at 266 N. Main St. would be demolished to make room for a two-story, 9,000-square-foot retail building that Ullrich hopes to fill with a specialty grocery store. Ullrich said it is possible that apartments could be built above the 9,000-square-foot retail building, but the development would include no more than 96 units in total. A feasibility study showed there is demand for at least 96 apartment units in Thiensville, she said. Just south of the Walgreens, NexJenn is proposing a 5,000-square-foot retail building that Ullrich hopes to fill with a restaurant. NexJenn plans to put an outdoor fire pit outside the building. The entire parcel, including the State Farm building, the Walgreens building and the apartment buildings east of the development site, are owned by Leander Jennings, the father of Ullrich and Beach. Jennings hired his daughters to develop the property. Jennings' father, David B. Jennings, developed a strip mall on the land roughly 50 years ago, but the strip mall was demolished about 20 years ago when the Walgreens was built. Ullrich said her family has talked about developing the site for years, and they believe their concept will contribute to the pedestrian-friendly nature of Thiensville. "We want to enhance the walkability of the site and create some welcoming green space and gathering spaces for Thiensville," she said. Ullrich said she and her sister decided to name the community Hawthorne Square because their family spent a lot of time on their father's farm on Hawthorne Road in Mequon. The Thiensville Village Board voted Jan. 21 to amend the village's land-use plan to allow multifamily residential and mixed-use commercial uses at 266-286 N. Main St. and 217-239 N. Green Bay Road. The project still requires a rezoning recommendation from the Thiensville Plan Commission on March 5 and rezoning approval from the Thiensville Village Board on April 15.